A group of international researchers with Diego Elustondo at the forefront can be close to a breakthrough that has major economic consequences. The group is now doing parallel trials, in the CT scanner at LTU Skellefteå and in a production kiln at the CMPC Forest Group in Bucalemu, Chile. This Eureka project is being carried out together with Vinnova. It's Alent's patented pump drying, which can be Columbus' egg to successfully dry the Eucalyptus nitens so that it can be used for floors and carpentry. Eucalyptus nitens is fast growing and planted for use in pulp. It is a hard and beautiful wood, but it collapses and cracks if it is dried in a conventional manner. It is Alent's innovative technology with rapid climate changes in harmony with the laws of nature that once again show new ways. CMPC already uses Alent's pump technology to quality drying pinus radiata, fast and energy-efficient. In the case of nitens Alent technology seems to be the only way to succeed. Our Nordic wood, pine and spruce, can be dried even faster to quality products with the growing knowledge of pump drying that we collect. Now the interest in drying oak, beech, birch and other wood is also increasing with our innovative technology. 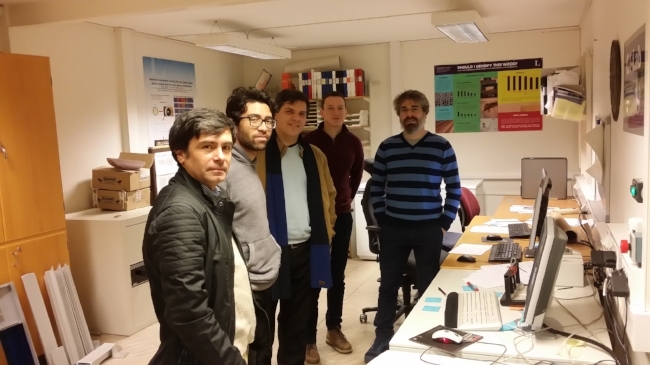 From the left: Salvador Morales and Ariel Inzunza Sepúlveda from TSST Chile, Diego Elustondo from Alent Dynamic, Ahec Ambroz and José Couceiro from LTU Skellefteå.